Our porch off the dining room-kitchen overlooks the pond at the bottom of the driveway, which is only visible one the leaves start to thin out. Our dog rejoices in the snow. Our front door is actually at the end of a long driveway, at the back of the house. The woodshed is in the background. After an 11-hour drive from our home town, we arrived in Maine at 1 a.m. last week on a Monday morning. We startled a huge deer in our driveway that looked like it was coming from the apple orchard I planted this Spring. 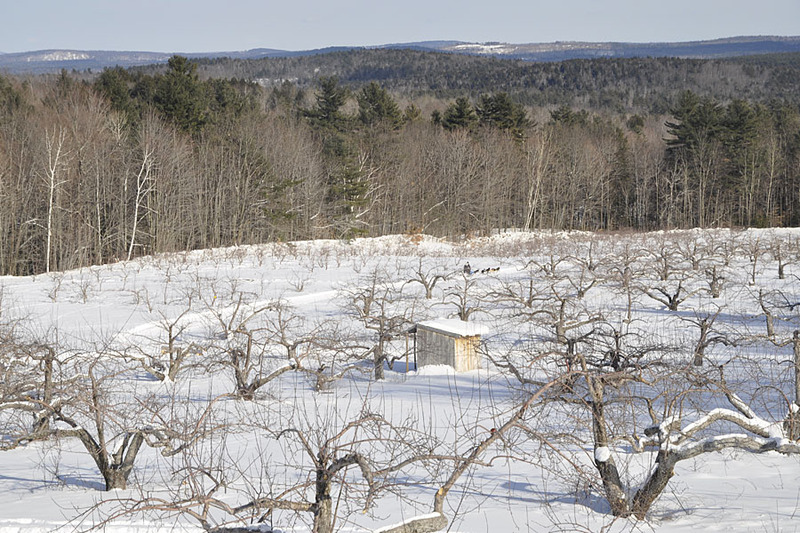 “Oh, no!” I thought, imagining the orchard’s decimation at the muzzle of a voracious deer. I certainly couldn’t do a thing about it at that hour of the morning in the pitch darkness. We quickly unpacked our overloaded car and collapsed into bed for a few hours’ sleep until sunrise. Early that morning I was pleasantly surprised to see that the homemade deer fence I had designed and constructed had worked, and the apple trees were not only not worse for the wear, they were growing vigorously and untouched by the deer. 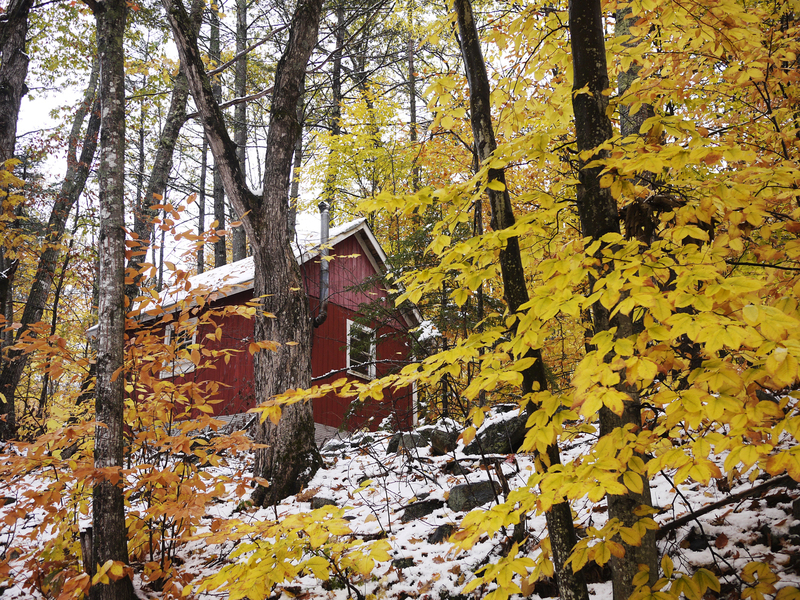 After I purveyed my property, I walked over to my neighbor’s cabin. He had planted 50 apple saplings the year before me but failed to remove the beech, oak and maple stumps when he cleared the land. Not only had those trees reestablished themselves, they had overtaken many of the apple trees. Additionally, he neglected to stake the apple saplings’ spindly trunks, and many had been irreparably damaged due to high winds. 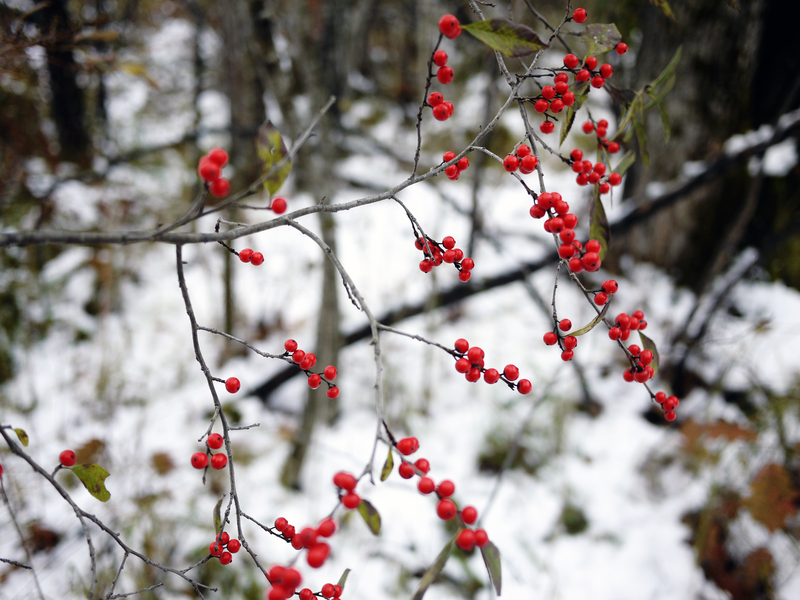 Finally, he had chosen not to fence in the orchard – – and signs of moose and deer were apparent everywhere. Those creatures had done a very extensive job of pruning his trees. Only about 15 healthy trees of his original 50 remained. During the week I decided to take advantage of the many nearby farms that were selling produce from the Fall harvest. 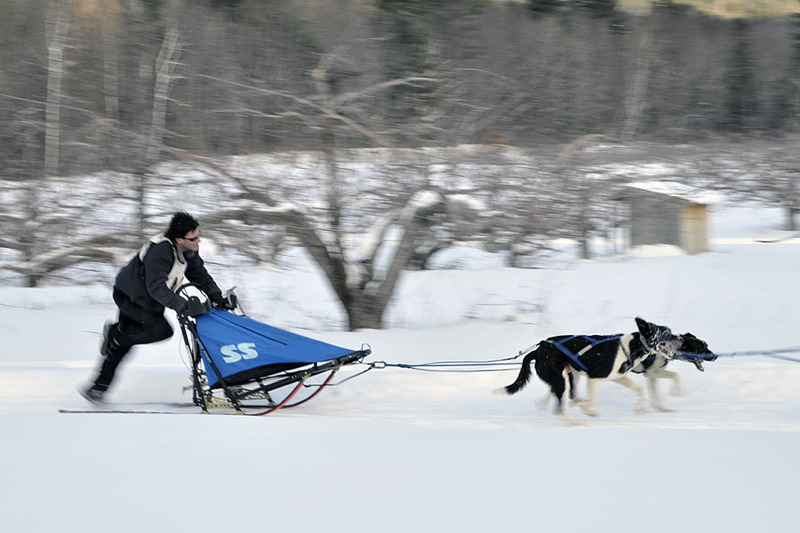 The first day I traveled west 6 miles to the New Hampshire border, but there was nothing to be had. Their crops had been flooded during Hurricane Irene and ruined. 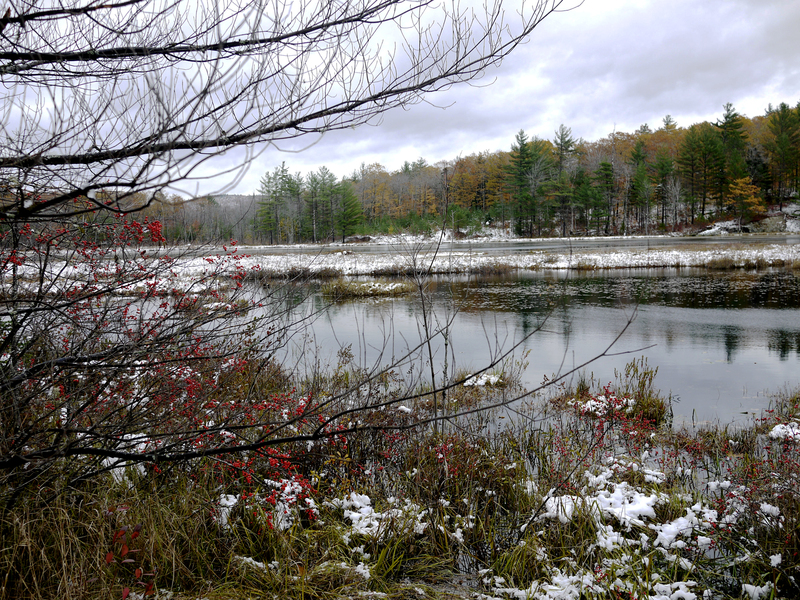 The next day I traveled 10 miles in the other direction on the Maine side, which had been spared the effects of Irene. I bought a bushel of Delicata squash, which is the sweetest, most wonderful squash you can ever hope to eat (even more tender and sweet than butternut squash), some kale and rainbow-, red-, and Swiss chard, pie pumpkins (a smaller variety that is great for baking and cooking), and many bushels of apples from two different orchards. You are probably wondering what I could possibly do with 150+ lbs of apples from two different orchards. Recently I bought a Breville juicer from Bed Bath and Beyond, and I’m having lots of fun making juices from apples, carrots, and all sorts of root and leafy vegetables. The owner of Five Fields Farm answered my question, “What is the difference in the way cider and apple juice are made?” Cider is made by crushing and extracting the juice from the entire apple, including the skin and core, which gives it its darker color and richer flavor. With apple juice, the apples are peeled and cored, and usually filtered, so the final product is lighter and less opaque than cider. The Breville juicer allows me to make cider, and *wow* is it delicious, especially when drunk moments after juicing. I will never go back to store-bought apple juice again! This past Shabbos we had some lovely guests from Portland, Maine. We weren’t sure how long past Shabbat they’d end up staying, since weather reports indicated a major winter storm was headed our way, and the man who plows our driveway had recently suffered a grievous injury. 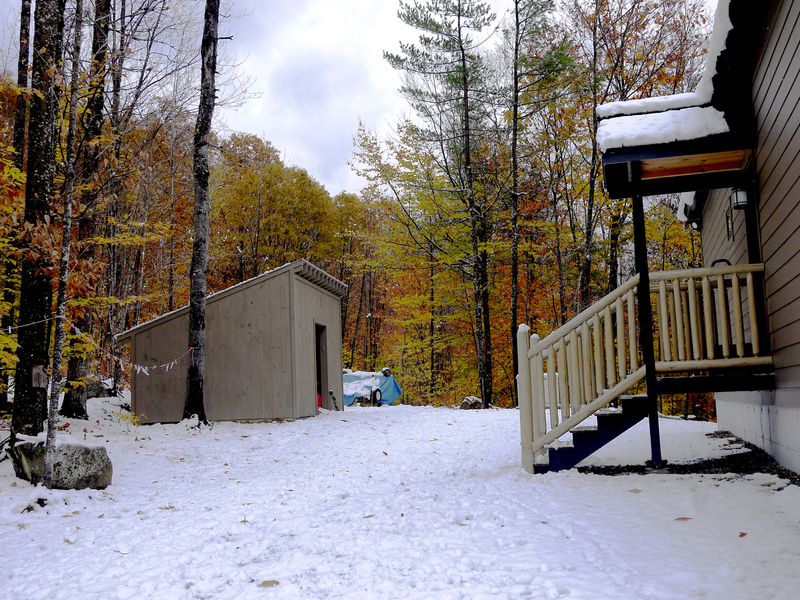 Despite a prediction of 14″ of snow, we got only 3″ on Saturday night, so our guests left on Sunday, on schedule. 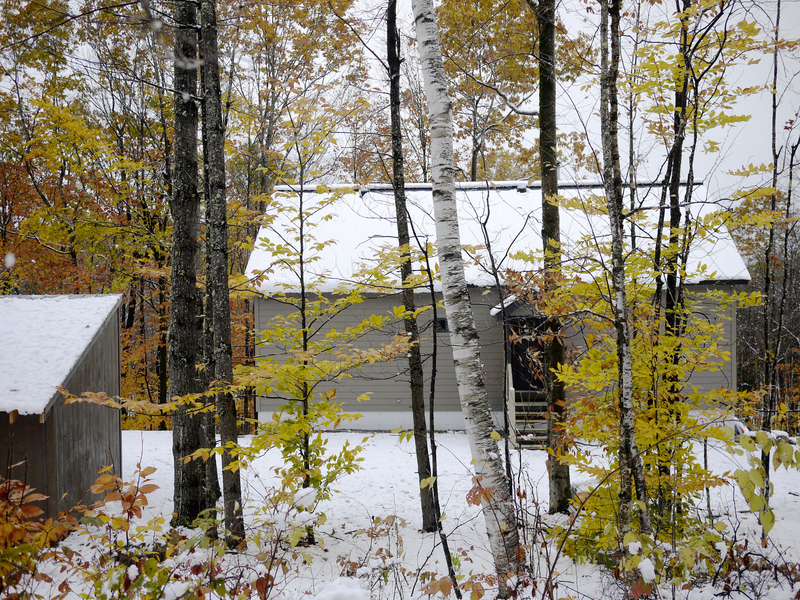 That said, it was quite unusual to get 3″ of snow in October, even in Maine. 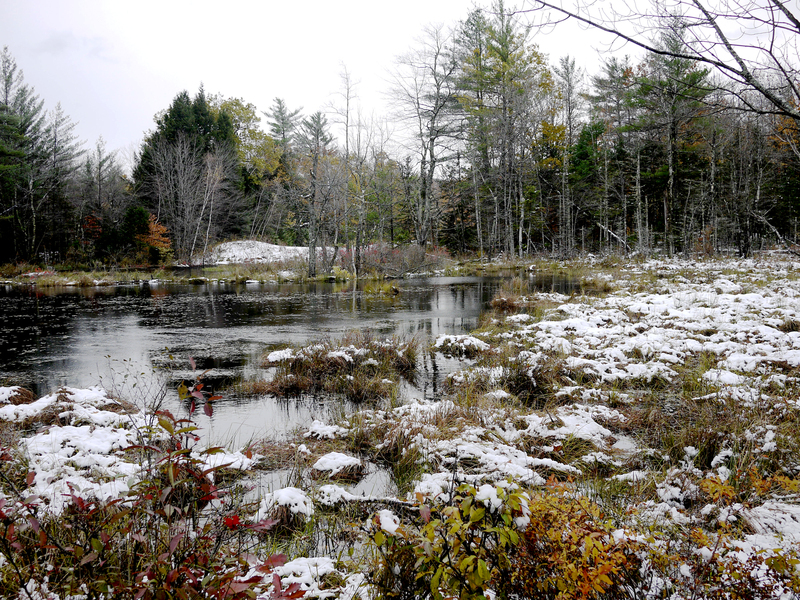 Today I had fun taking pictures around our property and across the street at the bog/pond. 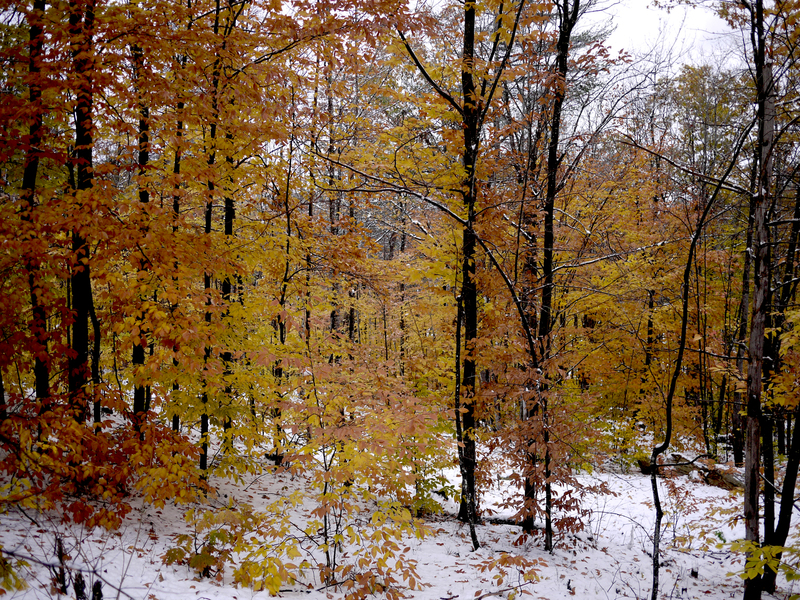 Typically the autumn leaves are long gone off the trees before the first snowfall, and the combination of gold leaves against the snow was quite a pretty and unusual sight. 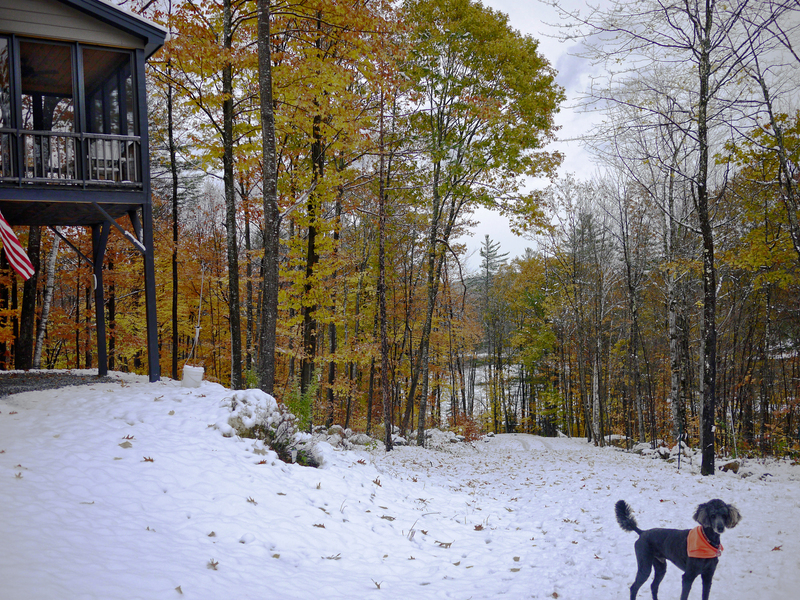 Some of you may remember a blog entry way back in October 2010 when I mentioned a Jewish couple we met in rural Maine that I called “the P’s” (click on this link, “Shabbat in the Maine Woods,” to read the original post). They host a Passover Seder every year at their home on a mountaintop, and about 40 Jews from a 100-mile radius show up year after year. It’s not kosher nor is it religious, but I think it’s a beautiful and amazing thing that completely unaffiliated and assimilated Jews, living far from any Jewish community life, desire to celebrate and commemorate the exodus and redemption of Jews from Egypt. One of the people in this group of “Jews in the woods” is a young man whose interest goes beyond Passover, and he began studying more about Judaism and eventually found an online study partner. The study partner is a young rabbinical student in Brooklyn, affiliated with Chabad. 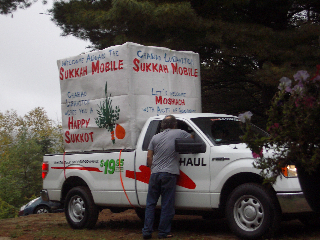 When the young man learned about the holiday of Sukkot last year, he said he wished he could somehow find a way to celebrate the holiday with a real sukka. So the rabbinical student got together with a few of his yeshiva friends, rented a U-Haul pickup truck, built a sukkah on the back of the truck, and drove all the way to rural Maine to the P’s mountaintop to celebrate the intermediary days (chol hamoed Sukkot) with any Jews the young man and the P’s could round up. They served bagels, lox, and cream cheese; the Chabadniks discussed the holiday and threw in some music and dancing, and a great time was had by all. About 20 people participated. 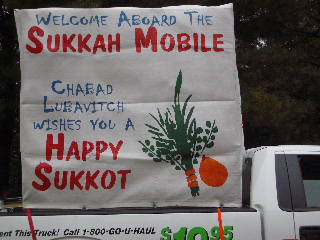 “We are once again having a Sukkos celebration in Maine thanks to the Lubavitchers of Brooklyn! 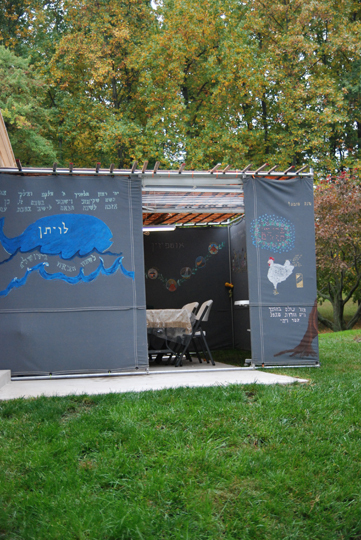 This year we will be creating our own Sukkah. In addition, ALL food will be provided. Please come on Sunday, Oct 16th @ 3PM. Since they will be providing all of the food – it will be kosher- this is not a potluck. We need to be able to give them numbers as soon as possible. Please RSVP no later than this coming Thursday, Oct. 13th. The sukkah will not be rolling in from Brooklyn this year.